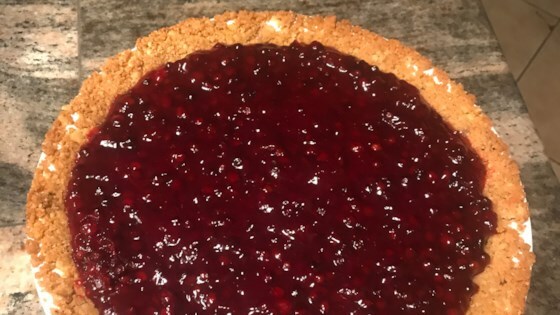 "This is a delicious cream cheese pie topped with a mouthwatering huckleberry topping." Mix the chopped nuts, flour, and salt together in a small mixing bowl. Cut in butter until lumps are the size of small peas. Press into a 9 inch pie pan. Lightly press a double layer of aluminum foil into the pastry-lined pan. Bake in the preheated oven for 20 minutes, or until golden brown. Remove foil and set crust aside to cool. Beat the cream cheese and 1/2 cup sugar together in a bowl until smooth. Fold in whipped cream and lemon juice. Spread over cooled crust. Refrigerate. Combine 2/3 cup sugar, cornstarch, water, and 1/4 cup lemon juice in a saucepan. Stir in huckleberries and bring to a boil over medium heat, stirring constantly. Simmer and stir until thickened and no longer cloudy, about 2 minutes. Cool. Spread huckleberry mixture over cream cheese layer and refrigerate until ready to serve. With a little less topping, it was GREAT! It would be 5 stars with 1/2 the topping. Superb, superb, superb!!! Followed recipe to a tee. Will definitely make again!!! have made this recipe three times and it is awesome. Everyone had nothing to say but good things thank you for this recipes. Today for a Christmas dinner I will make it again.